These thicker panels offer the same construction and design as our 2-inch panels. The only difference is the added thickness that increases the absorption at low frequences (100-500Hz). Core material is Roxul AFB mineral wool, a highly effective sound absorber (NRC 0.95 out of 1). Higher NRC means fewer panels are needed to treat your space. Built to last with a solid wood internal frame that protects edges and corners from dents and damage. 1/4-inch wood back panel for easy and secure installation without glue. Wall-mounting hardware and instructions included. Leaves no more wall damage then hanging a picture, ideal for temporary or rented space. Attractive, textured cover fabric is 100% jute, available in a range of colors to match your style. Combine sizes and colors in creative patterns for a unique and visually impressive look. Furniture-quality design and workmanship. Handcrafted in the USA. New! For perfect positioning and easy installation, our no-measuring installation template is now included free with all ATS Acoustic Panel orders. Data from independent testing of ATS Acoustic Absorption Panels by RAL, a leading acoustical testing laboratory. 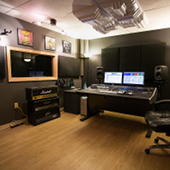 If you aren’t sure which panel thickness is best for you, check our Acoustic Panels FAQ page. Can I install these panels across a corner? Yes, if you choose the open-back option and you are interesting in maximizing low frequency absorption, you may choose to install some or all of your panels across a corner. We have a unique corner installation kit that makes it easy. For details see our corner installation instructions (PDF). Viewing general info. Click an icon to view info for a specific application. A good size for small tracking and mixing rooms. Also available in 2" thickness if you don't need the extra bass absorption of a 4" panel. A good size for small and medium sized rooms. Try diagonal mounting for a diamond shape, or multiple panels in a pattern to add visual appeal. This thickness (4") is not typically used in a large room. For an auditorium or large room consider our 24x48x2" panels or larger custom sizes. Our fire rated option (see below) is often chosen when panels will be installed in a public gathering place. This thickness (4") is normally not needed for noise control applications. We suggest our 2" thickness instead. Currently ships within: 3 - 5 business days. Extra bass absorption in a versatile size. More info on fabrics and colors. Panels with beveled edges have a 1/2-inch 45-degree eased edge around the entire rim of the panel. Panels with square edges have no bevel, like typical boxed art. This item is not fire rated. If you require or prefer fire resistance for your project, see our fire rated acoustic panels or our hardened-edge acoustic panels with fire rating. For flush mounting to a flat surface, installation hardware is included. For mounting across a corner, leaving a triangle-shaped space behind the panel, check this box to receive our corner installation kit instead. Corner installation is most often used with open-back panels. Your choice of fabric? Odd angles or special cutouts? Eco-friendly or recycled core materials? You name it! Just give us a call toll-free at 1-866-787-7881. My room sounds fantastic at a fraction of what I spent before.